A star was born at Bramall Lane yesterday (January 2). Martin Samuelsen’s the name. Remember where you heard it first. The 18-year-old Norwegian morphed into Lionel Messi, a much taller version admittedly. five minutes from the end of the latest absorbing Peterborough United contest at Sheffield United to seal a stunning 3-2 win. Conor Washington is about to shoot Posh ahead at Sheffield United. Photo: Joe Dent/theposh.com. The on-loan midfielder - first order of business for director of football Barry Fry in the January transfer window is to sort an extension to the teenager’s secondment from West Ham - accepted a short pass near the touchline and promptly weaved his way past several defenders before unleashing a venemous shot past home ‘keeper George Long into the corner of the net. He’d been on the field for just 10 minutes as a substitute for Marcus Maddison, but his goal will stay in the memory for far longer, as will a celebration that involved excitable substitute Lee Angol running onto the pitch to join in. Samuelsen’s dribble and strike - his first in the Football League - was so special it completely over-shadowed two spectacular goals from outside the penalty area from Conor Washington and Erhun Oztumer, and a comedy own goal from Jack Baldwin who had headed into his own net while lying prostrate just 90 seconds before the winning goal. Oztumer has of course been known as the ‘Turkish Messi’ for some time - two Messis in the same side is a rather exciting prospect. Posh manager Graham Westley described the win as ‘huge’ and not because it shifted an irritating monkey off his team’s back. This was the first League One win of the season against a team currently in the top eight, but it also proved that Posh can compete in a hostile, yet vibrant, atmosphere against an experienced team in great form. Where Posh’s December had been disappointing, Sheffield United’s had been decent. Bramall Lane is a magnificent venue for football of any standard, never mind the third tier, and the backing of the 21,000-strong home crowd for their team was incessant, or at least it was once misfiring striker Conor Sammon was substituted. A shot from Erhun Oztumer is on its way to the roof of the Sheffield United net. Photo: Joe Dent/theposh.com. And at half-time there looked only one winner. 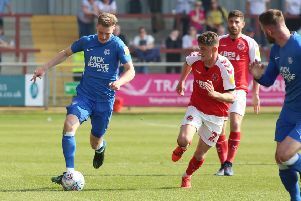 Posh had taken the lead through Washington’s rocket-shot on 18 minutes and the striker, as well as emergency left-back Andrew Fox, soon came close to doubling that advantage, but for the rest of the half. ‘The Blades’ threatened to inflict mortal wounds with their high-tempo, high-pressing, aggressive style. For the final 20 minutes of the end of the first-half Posh were under siege. They weren’t helped by a regular failure to clear the ball effectively or by constantly giving up possession when put under pressure. They also weren’t helped by another re-shuffled defence that contained Baldwin (he was making his first start for 14 months) as well as Fox, and the home side, thanks mainly to rampaging right-back John Brayford, made many inroads down the left side of the Posh back four. During ‘the Blades’ dominant period Billy Sharp struck the foot of the post, Ben Alnwick made a superb one-handed save from a David Edgar header, Baldwin and Michael Smith made terrific blocks to thwart Sharp and former Posh player Paul Coutts respectively, while Chris Basham managed to head wide from a free-kick when completely unmarked eight yards from goal with Alwnick stranded. Alnwick also saved well from a well-struck Coutts free-kick and Sammon shot wide after great approach play from Brayford. It was a surprise that it took a poor penalty decision to hand the home side their equaliser just past the half hour mark. Sharp collapsed to the ground under minimal contact from Smith, but somehow persuaded referee Darren Bond to continue his first-half policy of generosity towards his side and award the spot-kick. Sharp duly smashed it home Bostwick-style. But somehow Posh survived to the interval and emerged a much brighter attacking outfit and a more solid defensive unit. There are numerous advantages of young talented players over more experienced ones and stamina is one of them. The home side couldn’t sustain their pressing game after the break which enabled the Posh ball-players to show off their skills more often. Oztumer was outstanding in the second-half with his dribbling, passing and crossing. He required just four minutes to make his mark by advancing towards the penalty area and smashing a remarkable dipping, swerving effort into the roof of the net. An end-to-end game ensued but Blades’ keeper Long was called into action more often, most notably when pushing away Maddison’s long-range drive. Oztumer whipped a couple of lovely crosses into the area that just eluded team-mates. Baldwin was excellent after the break, helped by the calming presence of new signing Lawrie Wilson alongside him. It was a strange matchday capture in the sense that a right-back was signed to fill a gaping hole at left-back, but Wilson was quietly effective and the Blades’ threat from that area of the pitch was significantly reduced. Home substitute Jose Baxter and Sharp both saw on-target shots from the edge of the penalty area deflected wide, but they looked set to claim a point they probably deserved after a sweeping 83rd-minute move was rewarded by a fortunate finish. Centre-back Neil Collins completely muffed the six-yard opportunity a precise left-wing cross offered him, but Baldwin, unaware that there was little danger lurking behind him, diverted the ball over the line anyway. Baldwin’s blushes were spared by Samuelsen who completed the best set of goals in a single Posh match since David Farrell’s memorable play-off hat-trick against Barnet 15 years ago. It should be a morale-booster for Posh who, if they can get through a tough January programme unscathed, can still dream of a top two place. A dream that is also dependent on the transfer business due to take place this month. Posh: Ben Alnwick, Michael Smith, Andrew Fox (sub Lawrie Wilson, 46 mins), Ricardo Santos, Jack Baldwin, Chris Forrester (sub Miles Addison, 90 mins), Harry Beautyman, Erhun Oztumer, Jon Taylor, Conor Washington, Marcus Maddison (sub Martin Samuelsen, 78 mins). Unused substitutes: Dion-Curtis Henry, Lee Angol, Souleymane Coulibaly, Jordan Nicholson. Sheffield United: George Long, John Brayford, Jay McEveley (sub Che Adams, 73 mins), David Edgar, Neil Collins, Chris Basham, Paul Coutts, Dean Hammond, Martyn Woolford, Conor Sammon (sub Jose Baxter, 56 mins), Billy Sharp. Unused substitutes: Mark Howard, Ryan Flynn, Jamal Campbell-Ryce, Louis Reed, Kieran Wallace. Goals: Posh - Washington (18 mins), Oztumer (49 mins), Samuelsen (85 mins). Sheffield United -Sharp (31 mins, pen), Baldwin (own goal, 83 mins). Cautions: Posh - Fox (foul), Santos (foul). Sheffield United - McEveley (foul), Hammond (foul).